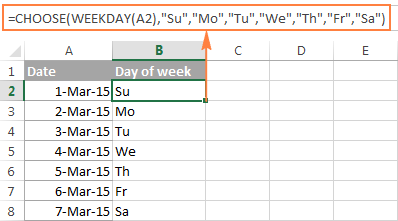 In this tutorial, you will find lots of formula examples demonstrating the use of WEEKDAY, DAY and DAYS functions in Excel. See how to return a day of week from date, get the number of days in the year, find how many days are between two dates and more. There are a variety of functions to work with days of year and days of the week in Excel, including WEEKDAY, DAY, DAYS, DATE and more. These functions can be used to determine workdays and weekends, calculate the number of days between two dates, count the number of days remaining in the year, return day of the week from date, and much more. Weekday Excel functions are particularly useful for planning and scheduling, for example to determine the timeframe of a project and automatically remove weekend days from the total. So, let's run through the functions one-at-a-time and see how they can help you cope with various tasks in Excel. Microsoft Excel provides a special WEEKDAY function to return the day of the week corresponding to a given date. The result returned by an Excel WEEKDAY formula is an integer, ranging from 1 (Sunday) to 7 (Saturday) by default. If your formula's logic requires a different enumeration, you can start counting with any day of week, as you will see in a moment. Serial_number - a serial number that represents the date, or a reference to a cell with a date or serial number. If the term "serial number" does not make much sense to you, let me remind you that Excel stores all dates as serial numbers beginning with January 1, 1900, which is stored as number 1. And it is these numbers that the WEEKDAY function operates on. If you want to learn more about how Excel stores dates and times, you may find the following article useful: Excel date format. Return_type (optional) - determines what day of the week to use as the first day in calculations. Note. Though the WEEKDAY function is available in all Excel versions, from Excel 2013 to 2000, the return_type values 11 through 17 were introduced in Excel 2010 only, therefore they cannot be used in earlier versions. 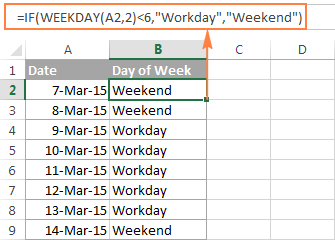 And now, let's look at some examples of using the WEEKDAY function in Excel. All of the below formulas return the day of the week corresponding to March 19, 2015. For the sake of clarity, this date is stored as number 42082 in Excel. At first sight, it may seems that the numbers returned by the Excel WEEKDAY function have very little practical sense. But let's look at it from a different angle and discuss some formulas that solve real-life tasks. If you have a long date column in your worksheet, you may want to know which dates are working days and which are weekends. An easiest way is to have a day name displayed in a cell, for example as "Friday, March 20, 2015" or just "Friday". And you can do this in no time by simply changing the date format. However, this is not always an ideal approach, firstly, because a short date format is often required, and secondly, because you may need to filter only weekends or only workdays in your Excel list. In this Weekday formula, we set the return_type argument to 2, which corresponds to the week beginning with Monday (day 1). So, if the day of the week in cell A2 is less than 6 (Monday through Friday), the formula returns "Workday", otherwise - "Weekend". 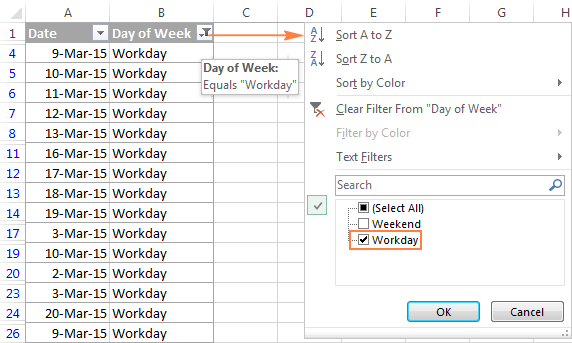 To filter weekdays or weekend days, you apply Excel's filter to your table (Data tab > Filter) and select either "Workday" or "Weekend". If your organization, or maybe some regional office of your company, works on a different schedule where the days of rest are other than Saturday and Sunday, you can easily adjust this WEEKDAY formula to your needs by specifying a different return_type . The Excel WEEKDAY formula discussed in the previous example has no problem with finding working days and weekends, no matter which days of the week are days off. However, you can improve the visual presentation of the results by shading workings days and weekend days in different colors. The results look much better now, don't they? 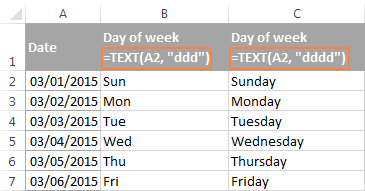 If you have a list of dates in Excel and you aim to find a day of week for each date, you do not actually need any special formulas :) The point is that Excel already knows what day of week a given date is and all you need to do is get it to display that information. ddd - to display an abbreviated day name, e.g. Sun. dddd - to display full day names, e.g. Sunday. Please note that the results, which may look like usual text entries to you, are in fact fully functional Excel dates that you can use in other calculations. You can tell these are dates by their right alignment in a cell as opposed to left-aligned text values. Where A1 is a cell with the original date. When using this method, please remember that the TEXT function in Excel always returns text strings regardless of the source cell's format. So, the day of week names you see in the above screenshot are text entries, and not dates. And this is what makes them different from the results of the previous example, which are still fully functional Excel dates. 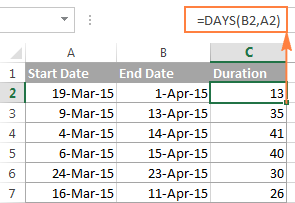 Yet another way to find the day of the week from date in Excel is using the WEEKDAY function in liaison with CHOOSE. An advantage of this formula is that it lets you return the day names in any format of your choosing. 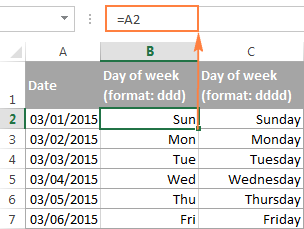 In this formula, the Excel WEEKDAY function gets the day of week as a serial number. And the CHOOSE function uses that number as index_num (the 1st argument) that indicates which value from the list of value arguments to return. Note. The Excel DAY function correctly handles dates in different Date formats, though the problems may occur if dates are entered as text. 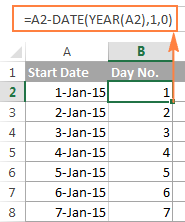 Please see How to distinguish normal Excel dates from text dates for full details. =TEXT(A2, "dd") - to display day numbers with leading zeros. Note. The Excel TEXT function always returns text strings, not numbers (please notice right alignment of numbers in column B and left alignment of text values in columns C and D in the screenshot below). So, if you plan to use the returned days in calculations or other formulas, use the DAY function rather than TEXT. This formula will work with normal dates as well as dates formatted as text. If either the start date or end date is a text value, Excel will try to convert it to date (you would use the DATEVALUE function for this). 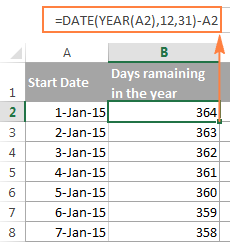 If Excel is unable to parse your text sting as a valid date, the DAYS formula will return the #VALUE! error. This example demonstrates how you can get the number of a certain day in a year, between 1 and 365 (1-366 in leap years) with January 1 considered day 1. Where A2 is a cell containing the date. And now, let's see what the formula actually does. The YEAR function retrieves the year of the date in cell A2, and passes it to the DATE(year, month, day) function, which returns the sequential number that represents a certain date. So, in our formula, year is extracted from the original date (A2), month is 1 (January) and day is 0. In fact, a zero day forces Excel to return December 31 of the previous year, because we want January 1 to be treated as the 1st day. And then, you subtract the serial number returned by the DATE formula from the original date (which is also stored as a serial number in Excel) and the difference is the day of the year you are looking for. For example, January 5, 2015 is stored as 42009 and December 31, 2014 is 42004, so 42009 - 42004 = 5. Where 2015 is the current year. 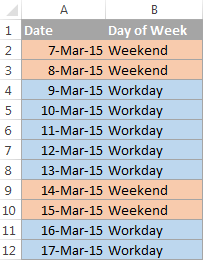 This is how you work with days of week and days of year in Excel. In the next article, we will explore Excel functions to operate on bigger time units such as weeks, months and years. Please stay tuned and thank you for reading! 131 Responses to "WEEKDAY, DAY and other functions to calculate days in Excel"
If the date field is blank how do I get the return cell day of the week to stay blank? The =WEEKDAY(A2) formula is working fine and reporting as needed into the day of the week when the date is filled in, but if the date cell is blank yet (haven't added that data line yet) how do I get the day of the week cell to stay blank also? Say I want an "IF" formula that checks a cell (a1) with a date indicated then on a different cell (b1) it validates the indicated date on cell A1 that its already pass 3 business days once confirmed cell B1 would indicate as a "Yes" if not then a "No", is this possible? Hello, I've got a problem with a specific formula. Working date (using =workday(todays date,5)+time(15,0,0) so it adds +5 to working date + declares time of 15:00:00. For my purpose, I need the format to remain dd-mm-yyyy 15:00:00. The issue that I'm having is that once the time passes 15:30:00 on today's date (=now() function) - I need the working date to increase from 5 to 6, so it becomes tomorrow's work. may i get the answer in Microsoft Excel to these questions and reassure me if I can be selected. 1.sunday - Saturday + 4 Monday =? , Thursday - 3 Saturday + monthly total = 2. Summation = Sunday of the month divided by summation Monday of the month. 3. 40% of the Wednesday of the month multiplying by 20% of Friday. I'm counting on you really.